Eco Waterway Services can service your ponds beyond just removing unwanted vegetation. Highly decayed vegetation and other organic material eventually turn into sediment, muck, that mushy stuff that can sometimes swallow your legs. ECO can dredge to remove that material and clean up the funk accumulating at your shorelines. Although dredging a lake or pond can present unique challenges, and all sites have their own roster of guidelines to abide by such as permitting (of non-private waters), limited accessibility, years of sediment fill-in from run-off, accumulated expired vegetation, and tree debris, Eco Waterways excels at overcoming these challenged situations. 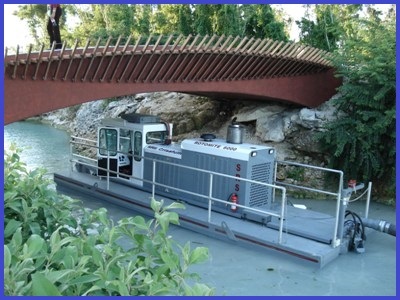 We are motivated, innovative, experienced and equipped using our mechanically and hydraulically powered suction-head dredge that removes muck from your pond, lagoon, or lake. Standard procedures are in place to limit disturbance to your property and to limit disturbance of aquatic life in and surrounding waters as well!